Our shed with porch pool house is custom built in the exact size and layout you want. You choose the location of the porch; it can be put on the end, the side or the corner of the structure. The porch comes standard 40" deep, in whatever length you choose. 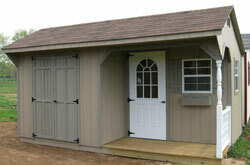 The porches on our sheds are available in larger sizes. Our Amish built shed with a porch comes standard with a set of double doors, a single door and 3 windows. You’ll notice a difference between our pool house with porch and our storage shed with porch space. The pool house with porch has an additional window and single door. The flower box on the first picture is optional and the wood doors are usually built with X’s on the bottom panel of the door. We deliver garden shed with porch orders throughout Virginia. Furthermore, delivery is free to the 21 local counties in Virginia. Here is video of a wood shed with a porch on the end. The selection of sheds with porches at Alan’s Factory Outlet attracts the attention of many of our shoppers. Some of these shoppers envision storage sheds as dull, plain-looking structures. But, when they peruse our selection of sheds with porches, they discover just the opposite! At Alan’s Factory Outlet, we have garden sheds with porches that combine practicality with visual appeal. Check out some other reasons that customers enjoy our selection of sheds with porches. When a customer purchases a garden shed with porch space, he or she has a comfortable place to relax. An owner can put a small chair on the porch of the garden shed and rest awhile. If a little sprinkle starts to fall, the owner of a storage shed with porch space will stay comfortable and dry. Alternatively, a shed with porch area can serve as a pool house for friends and family. Family members can store their pool toys and swimming pool cleaning equipment inside the shed. Also, they can sit and watch the swimmers from the comfort of their shed with porch space. One of our garden sheds with porches makes for an ideal place to relax! Many of our customers who buy garden sheds with porches like to decorate them. For instance, an owner may set out a few flower pots to dress up his or her garden shed with porch space. Also, an owner may want to hang a friendly sign on the door of his or her storage shed with porch space. This space can be the perfect place for hanging plants, wind chimes, and other outdoor décor! Finally, each garden shed with porch area is Amish built. Consequently, they are sturdy structures with a quality design. Our customers trust the craftsmanship of the Amish! We offer a selection with many sizes, designs, and colors to meet the needs of all of our shoppers. 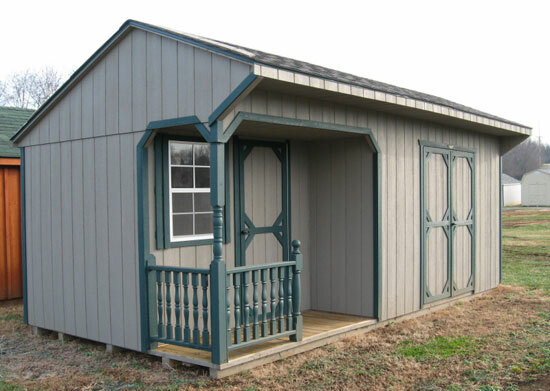 At Alan’s Factory Outlet, we have a storage shed with porch that is perfect for you!